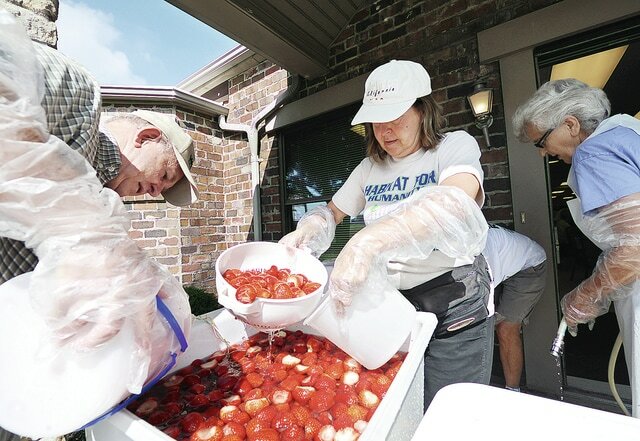 John Baldwin, left, Paulette Stanley and numerous others help with cleaning strawberries Thursday at the Troy Senior Citizens Center. The center began cleaning, slicing and stemming boxes of strawberries from Marsh early Thursday morning in preparation of the strawberry shortcake the facility will offer this weekend during the Troy Strawberry Festival. TROY — The streets are filled with both sweet strawberry treats and sweet music throughout the 2015 Troy Strawberry Festival today and Sunday. Strawberry Festival downtown entertainment chairwoman Roberta Jacobs said the festival performers are all fun, family friendly, and can be enjoyed with a strawberry smoothie in hand. This year’s entertainment schedule is packed with local and regional talent including Home. Grown. Talent contestants, Troy native Zac Roetter and Megan Osman, and new sounds of the Mad River Railroad, and featured performance from the Gas Pump Jockeys on Saturday evening. Other Prouty Plaza performers include Electrobeck and One Eye Whiskey. The Gas Pump Jockeys touts “More Songs Per Gallon Than Any Band in North America!” and will perform at 5:30 p.m. Saturday on Prouty Plaza. In addition to performing some of the greatest rock classics, The Gas Pump Jockeys add a comedic element to their very energetic performance. And just to “top off the tank,” the band encourages their audience to become a major part of their show. They will clap, sing and laugh away their evening. Music and entertainment will be held both downtown on Prouty Plaza and at the lower levee during the festival. Times and performances are subject to change. Grab your favorite dish and soak in the sweet sounds of the 2015 Troy Strawberry Festival entertainment offerings.